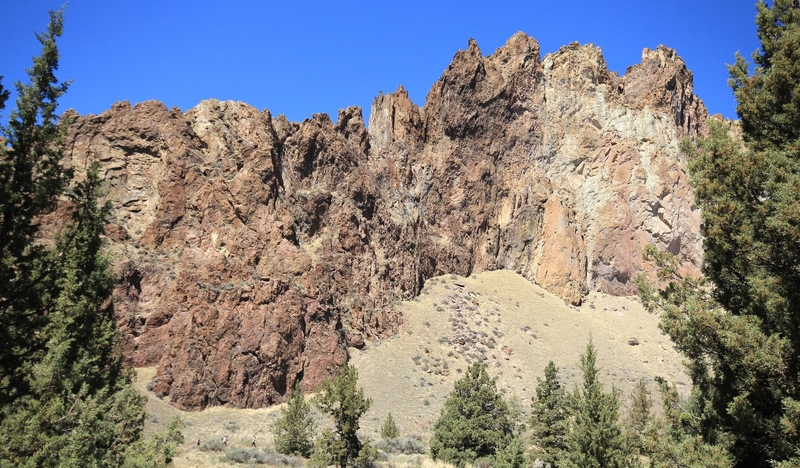 After our morning of hiking the stunning Misery Ridge Trail in Central Oregon’s Smith Rock State Park, we wanted a relatively short and easy hike to finish our day. 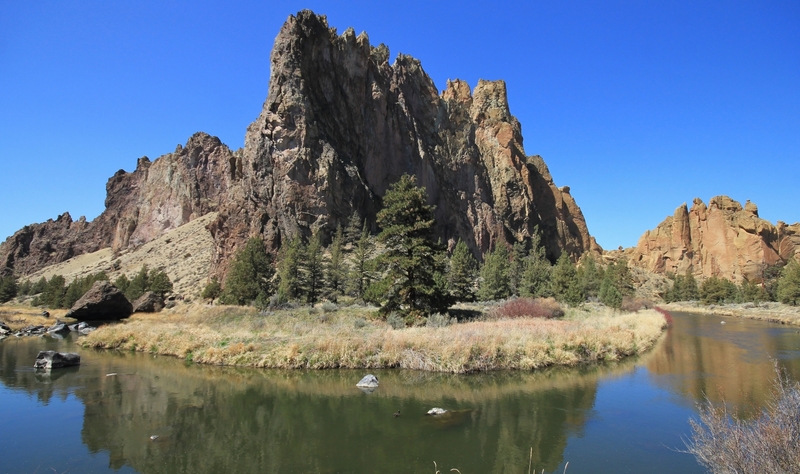 We simply had not gotten enough of what Smith had to offer and with sunny conditions and temperature near 70, you couldn’t ask for finer spring hiking. 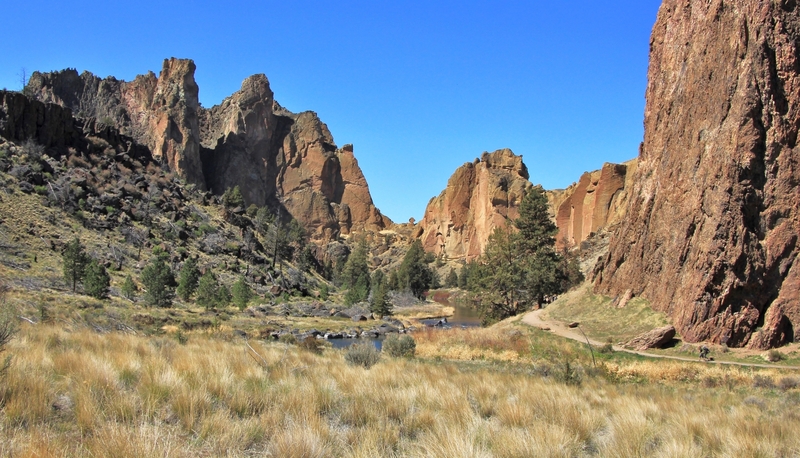 Finishing the Misery Ridge loop, we crossed back over Crooked River and found ourselves at the base of the Canyon Trail. It seemed as good a trail as any, so we headed out on that. 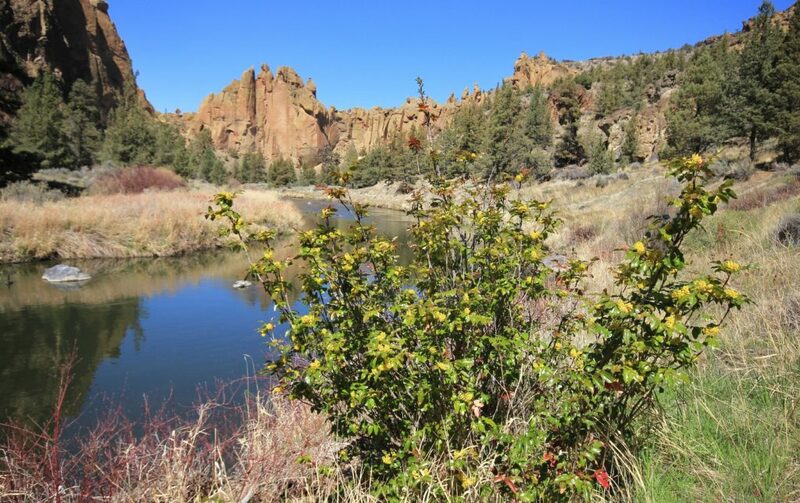 For those starting at the Welcome Center, hike NE on the Rim Rock Trail and hang a left on the initially paved Canyon Trail. The first 0.1 mile of the Canyon Trail is quite steep, but the paved surface provides good traction. 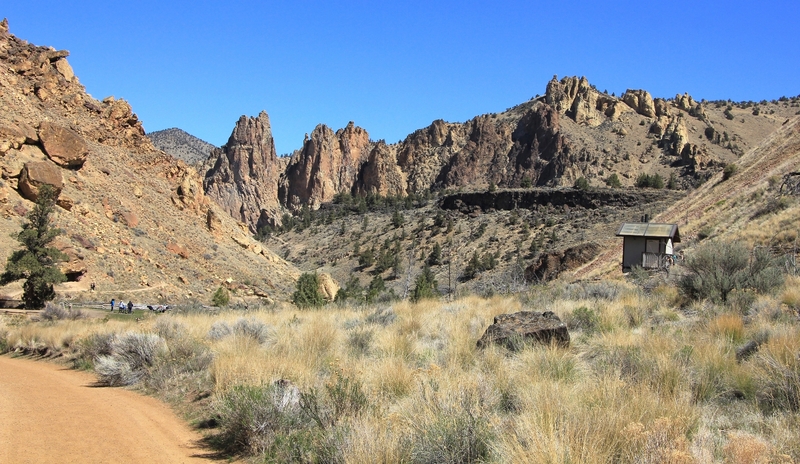 Passing the Chute Trail on the right, the descent moderates as you transition to well maintained gravel trail. 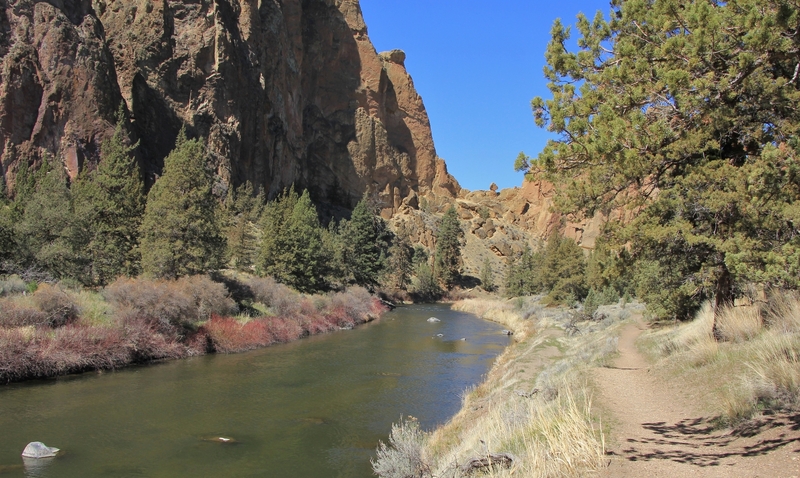 After another 0.2 miles take a slight left at the Y which will take you up Crooked River following our course described below. 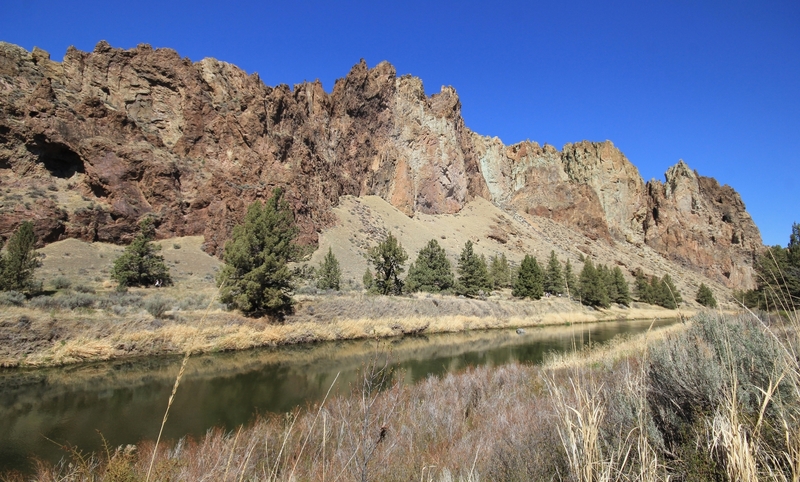 The Canyon Trail followed alongside Crooked River much as the River Trail had on the opposite. 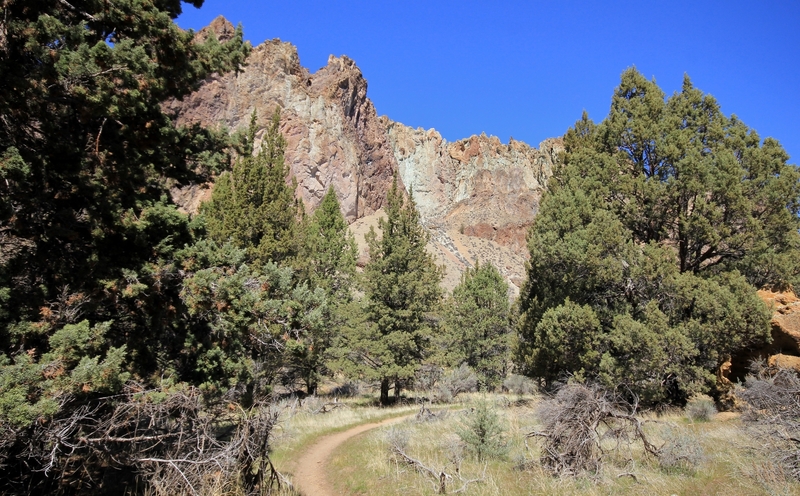 While this trail had similar views of the towering rock walls, much of the trail was down in the pine trees which I enjoyed. 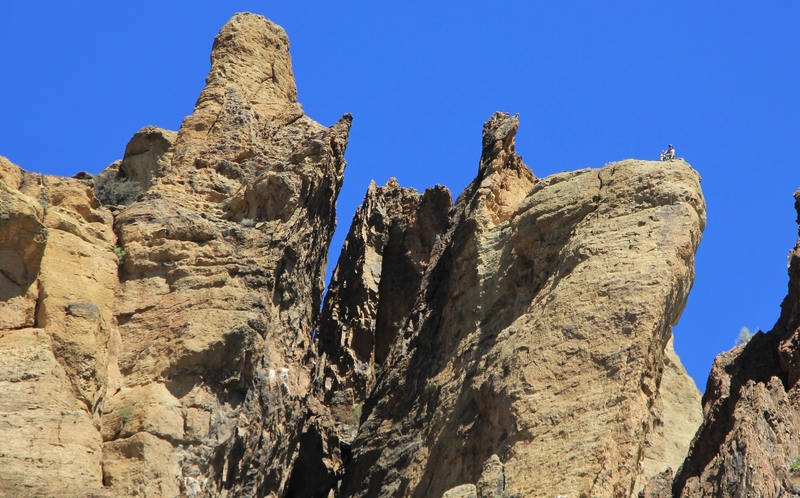 can you see the climber perched up there? At 0.4 miles from the footbridge we passed Rope-de-Dope climbing area. 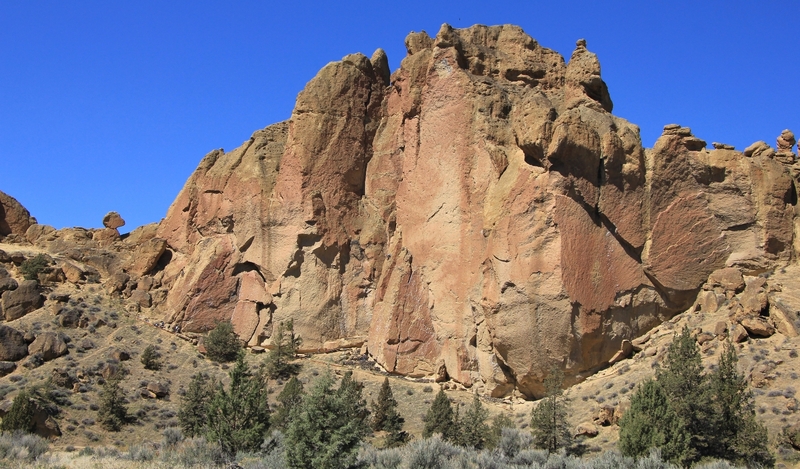 We saw quite a few people roping up and climbing here. These rocks were not nearly as tall as those on the far shore, so I’m guessing they provide easier routes. 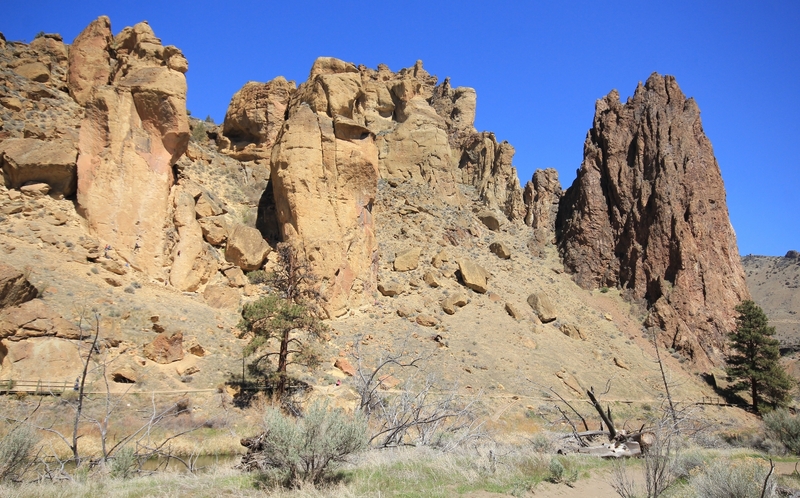 Continuing on, we discovered that the Canyon Trail provides the same impressive rock views as River Trail. 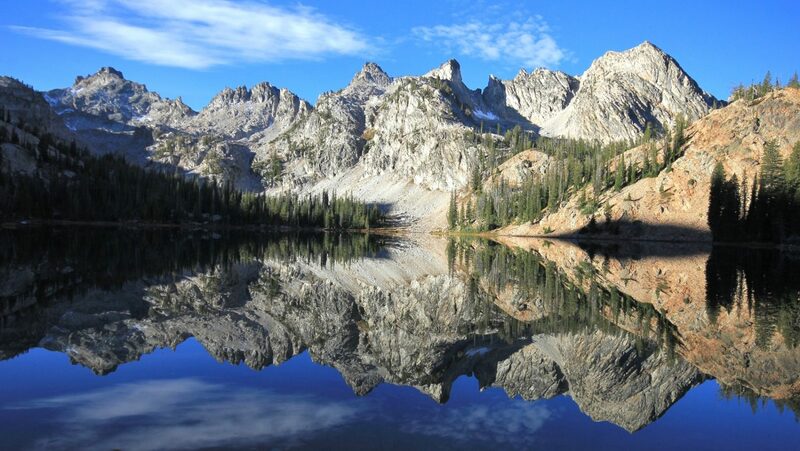 Just past Rope-de-Dope, we had great views up to Asterisk Pass. After this, we only saw a couple other people making this a nice section of trail for beating the crowds. 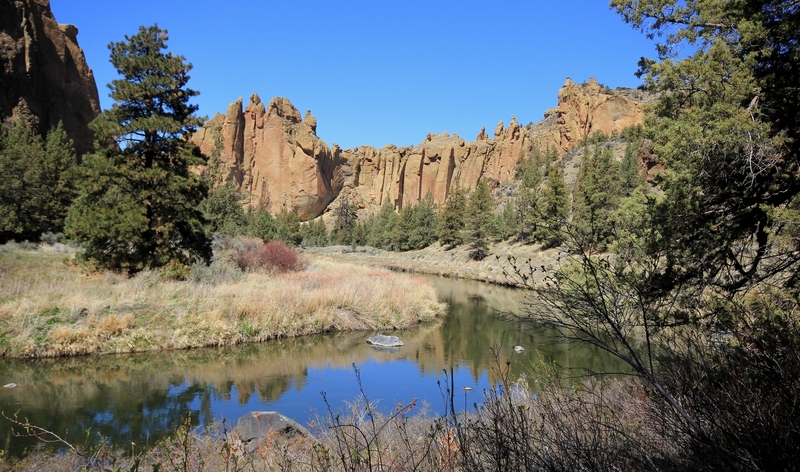 After another 0.2 miles, we came to the horse ford of Crooked River. We took the short spur trail to the ford and enjoyed a nice break along the river. We continued up stream to about the one mile point. The trail continued another half mile, but we decided to call it a day. And what a day it had been! 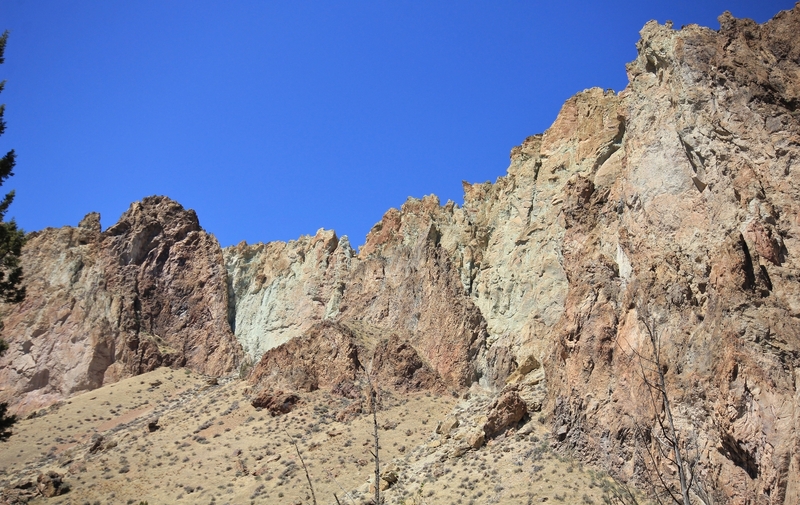 For those able to handle steep, rocky trails, Misery Ridge is simply spectacular—a must do for any serious hiker. 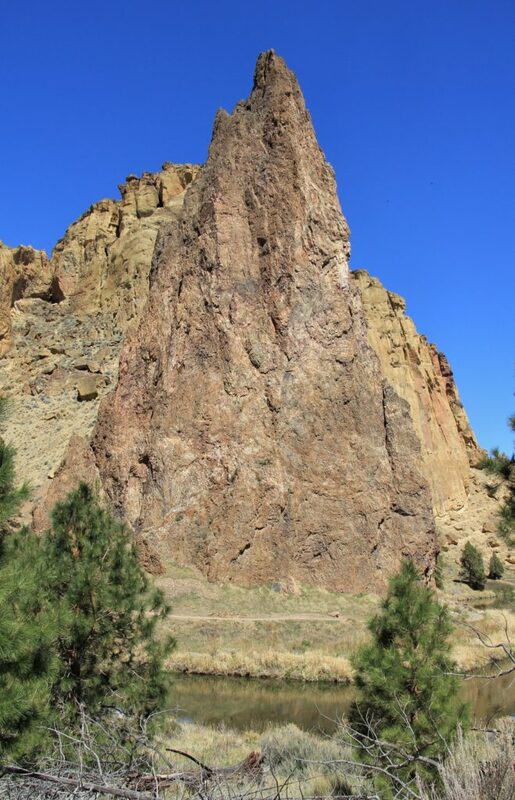 For those wanting a less strenuous route, the Canyon Trail does a great job of showing the character of Smith Rock State Park for much less sweat factor. I highly recommend both! 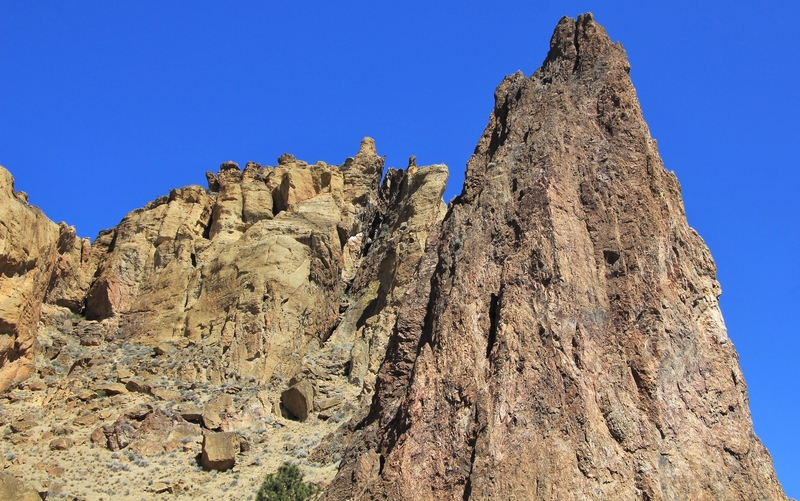 Stay tuned for our next and final post from Smith Rock State Park. 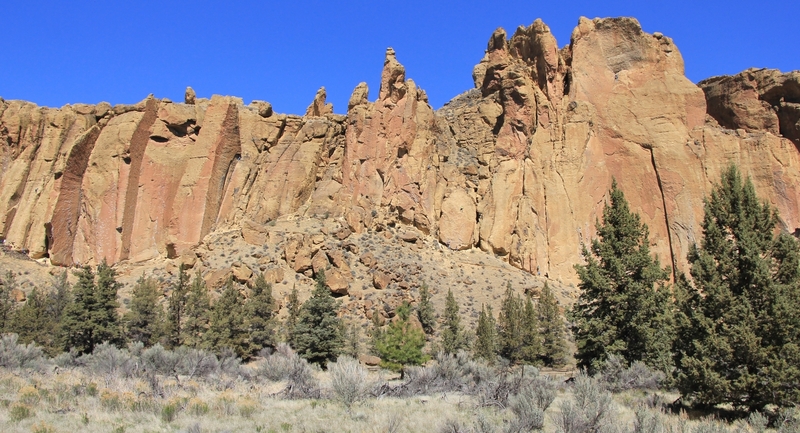 We’ll show you what the park’s longest trail looks like. If you like what you saw here, you won’t be disappointed.